Agility training is the best activity for maximum bonding between handler and dog, as well as for discipline and control. As agility brings out the full potential in both the handler and the dog, it is a win-win situation. There are many success stories of rescued dogs given a second chance at a good life through agility. As the first American-bred dog for companionship, the Boston Terrier's agile mind and body and willingness makes him or her a prime candidate for agility. 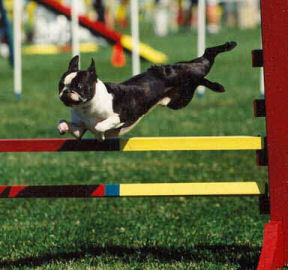 Bostons thrive on one-on-one activities with their owners. Although athletic and tough, they can be manipulative. Therefore, the handler should guard against enabling the dog. As Bostons develop many unwanted behaviors out of boredom, they need a job that is both mentally and physically stimulating, as well as something to consistently anticipate. Not all Bostons enter agility to compete. Many participate in agility for fun, confidence, obedience, bonding and respect as a team player through a game. Agility keeps both the dog and handler physically and mentally fit and establishes who's in charge (pack leader) with a positive attitude and respect. The dog's success lies in proper communication between the handler and the dog. Many times a dog's actions reflect the idiosyncrasies of the handler. Therefore, the handler needs to fully trust and follow instructions of a competent teacher and not second-guess. There are no grey areas in a dog's mind, only black and white. Everything needs to be exact, i.e., acceptable or not acceptable. Body language, eyes, voice commands and energy have to be very positive and consistent. Unacceptable behavior should be briefly addressed and acceptable behavior should be a license to party! Most importantly, although it may not come easily to some handlers, they should be energetic and fun, not boring, to their dogs. It is important through various testing to know if your Boston is structurally sound and can see and hear well. If acquiring a Boston, it is important that the sire and dam have been tested: BAER (hearing), CERF (eyes), patellae (knees), hips (no dysplasia) and back (no hemivertebrae). If these tests have not been done, new owners can have them done so they know if there are any handicaps to consider in a training program. Breathing difficulties are not related to length of muzzle, but to airway obstruction. A surgeon familiar with the Brachycephalic (short muzzled) breeds will be able to identify and correct problems. Since agility is a contact sport, injuries can happen to knees, backs etc. Since the Boston is a very stoic breed, be aware of changes in behavior that may indicate a masked problem. Proper weight and food are crucial to structural soundness and performance. 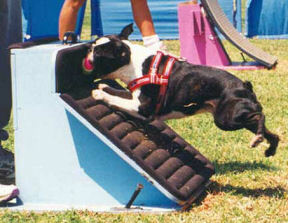 Conformation weight is detrimental to the agility dog and will slow them down and increase the rate of breakdown. Performance Bostons should be lean, mean machines. Food such as Innova Evo should be very high in protein and fat with carbohydrates being potato, not grain, to avoid muscle cramping. Excellent additives are Ester C powder, fish oil, Missing Link Plus, organic apple cider vinegar and Canine Whole Body Support from Standard Process (the best veterinary vitamin/mineral supplement). These additives can be mixed with some diluted canned Evo to form a gravy for the kibble. This is topped with a tablespoon of plain goat milk yogurt to help digestion and prevent soft stool. High-quality, raw chicken necks with or without a little skin/fat add live enzymes and energy and build muscle, bones and cartilage. Raw center cut beef marrow bones cut to adequate size and fed regularly help support the knees and aid healing and strength after leg surgeries. Raw organ meats should be fed now and then along with raw broccoli, carrots and fruit not poisonous to dogs. Feeding whole necks and beef marrow bones helps keep the teeth free from tartar buildup etc. Feeding the morning before a performance is not recommended. This compromises the system during performance. Digestion takes a lot of energy. Treats used for warm-ups and rewards will be sufficient. Feed light at the end of each day of performance. Fasting helps build the immune system! Short nails are imperative. Since the length of nail affects the use of the paw pad for traction, a Dremel with a Dremel Flex Shaft attachment is highly recommended for nails every four to seven days. Continuously moving from toe to toe avoids fixation and allows the blood to seek the end of the vein. Stop when a speck of blood is seen at the end of the nail. This guarantees the vein will recede. Pads should have excess hair trimmed; they are suction cups on equipment. It is essential to warm up yourself and your Boston both physically and mentally before a performance. This establishes focus and safeguards against injures. When trialing, x-pens on mats instead of crates are recommended to avoid muscle cramping. Blankets can be used as needed for warmth, inside and clamped along the side for wind/rain protection. Shade cloth clamped on top will help shade and contain exuberant Bostons. Electrolytes can be used in the water in extreme heat. Bach Rescue Remedy has been known to stabilize nerves of both hander and dog without compromising performance. A small spray bottle for water is good to keep the Bostons hydrated and their throats clear from treats before a run. On warm days, this comes in handy as well as a two-gallon lawn and garden plastic chemical sprayer purchased and used for water only. Train for excellence with directionals ("left, right and go") and run them like Border Collies. 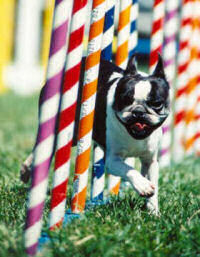 A well-trained Boston is a highly competitive team player and often places high in the ribbons. A loyal companion with a heart and desire to please, a Boston will take you places you would never have otherwise ventured!